We are all of us standing on the shoulders of the writers who came before us, and it's no secret that I tend to favour writers who do so blatantly. 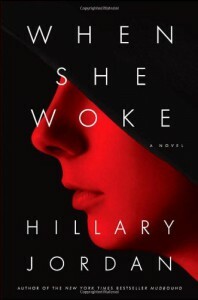 In a way, When She Woke's greatest success is that it might finally lift Hawthorne's The Scarlet Letter to the top of my reading pile.Jordan has used the basics of Hawthorne's story to reinvent a classic into a frightening dystopian novel that is far too possible considering the bent of newscasts today. In a world where the human birthrate has dropped to dangerously low levels and the United States of America have taken a turn for both the right wing and the highly religious, Hannah Payne has committed the crime of having an abortion. In not naming her child's father or the doctor who performed the procedure, she's extended her sentence, not that she was likely to survive the shorter one. In this society, only the most dangerous criminals are incarcerated. All the others are melachromed. She remembered the first time she'd seen a female Chrome, when she was in kindergarten. Then as now, they were comparatively rare, and the vast majority were Yellows serving short sentences for misdemeanors. 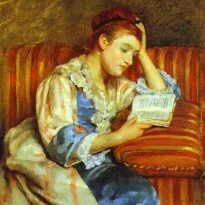 The woman Hannah had seen was a Blue--an even more uncommon sight, though she was too young then to know it. Child molesters tended not to survive long once they were released. Some committed suicide, but most simply disappeared. Their bodies turned up in dumpsters and rivers, stabbed or shot or strangled.Hannah goes from the Chrome Ward to the Straight Path Centre, a place that to me recalled Lowood School in Jane Eyre. But there Hannah mets Kayla, and the pair become each other's anchor in this new and hostile world. I found it interesting that in this dystopia, as in many others, Canada is set up as the utopia of the "normal world". In the Canada of this novel, melachroming is considered barbaric, abortion is still legal, and equivalencies of the Sanctity of Life and Freedom From Information laws have no chance of passing. While I do appreciate the flattery of this trope, I'm concerned about the downside. For all the joking portrayal of Canada in the media, we are not the destination. We are on the journey just like other progressive countries. We have out bigots, we have our stupid laws and customs, we are not a racist/sexist/homophobic-free zone. In being portrayed as a utopia, I fear my fellow Canadians can be lulled into complacency. All that said, I can forgive Jordan her use of the trope, as it's much easier for the people of her world to sneak across our border than to swim over to Sweden.